In an effort to find easy, cost-effective but healthy foods, we stumbled across this simple recipe for Pulled Chicken Tacos. 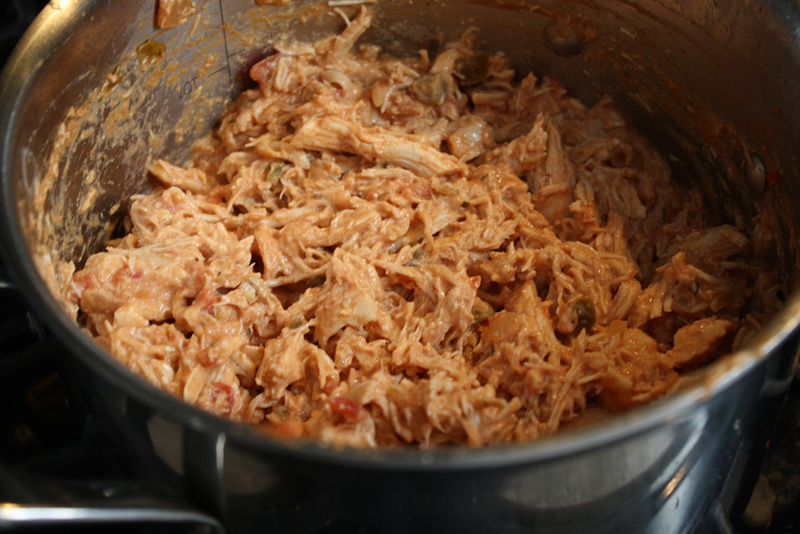 We love pulled chicken and were excited by the possibilities of this simple recipe. Having used frozen chicken to make pulled chicken before, we decided to go that route as you get roughly 2 pounds of frozen chicken for every 1.25 pounds of "fresh" chicken. Having purchased all necessary ingredients, we set to work. At only 4 WW Points per serving of filling, we couldn't wait to try out these easy to make tacos and share them with you! Combine the taco seasoning, chicken breasts, and salsa in a crockpot. Set to low and cook for 6-8 hours. Then, use two forks to shred the chicken. 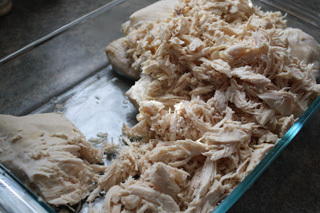 Note: To make it easier to shred, we transferred the chicken to a 9" x 13" baking pan for added shredding space and then put it back in the crockpot. When your chicken is all shredded, mix in the sour cream and warm until heated through (about 5-10 minutes). Put the chicken in a large pot and cover with water. Bring to a boil and cook for about 25-30 minutes or until the chicken reaches an internal temperature of 165F. Then, use two forks to shred the chicken. 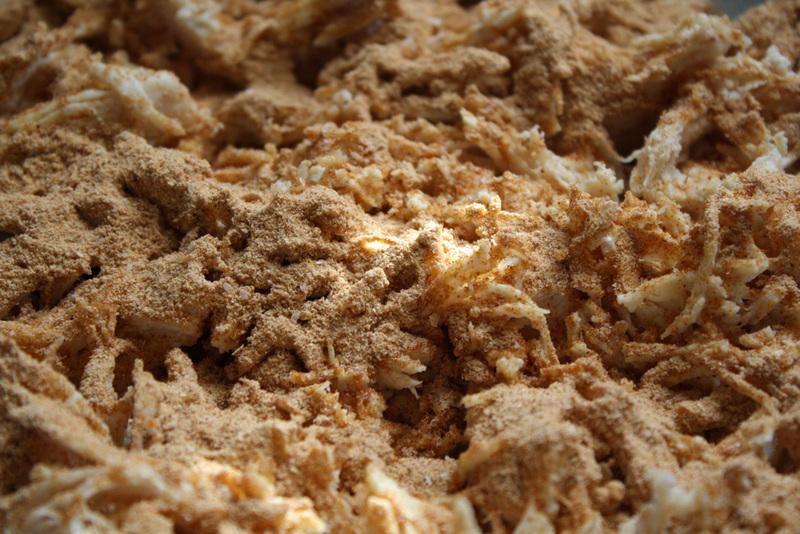 (Again, it may be helpful to transfer it to a baking pan for the shredding portion). Combine the shredded chicken, salsa, taco seasoning, and sour cream in the large pot and cook on medium heat until heated through. Now you're ready to assemble your tacos! 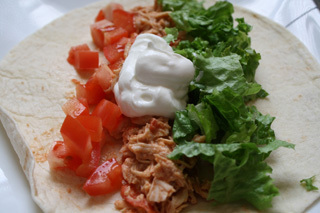 Grab your favorite tortillas and top the chicken with lettuce, tomatoes, cheese, and sour cream. Serve with a side of taco chips and guacamole and you have a fabulously filling meal. 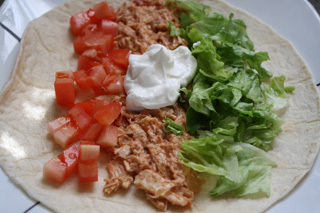 This seasoned pulled chicken also works great in a crunchwrap supreme, as a burrito, on top of nachos, or for enchiladas. Enjoy!